A cast iron lead pot and ladle set provides economical equipment for casting all sinkers, jigs and lures. We recommend a pot with a 15 to 20 pound capacity. 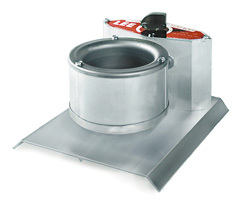 Two types of electric lead melters recommended for use with Do-it Molds are either the "dip-out" type or the "bottom pouring" type. 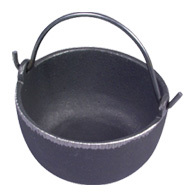 Most units require use of a ladle or lead dipper. Sizes available range from inexpensive small capacity 4 lb. caster through large 40 to 50 lb. 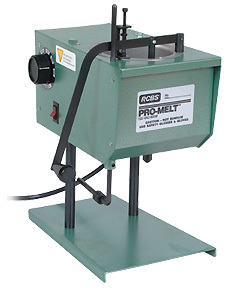 capacity industrial solder melters used by commercial tackle manufacturers. Bottom discharge spout forces the molten lead to enter the mold under slight pressure, usually producing perfect castings from even a cold mold. 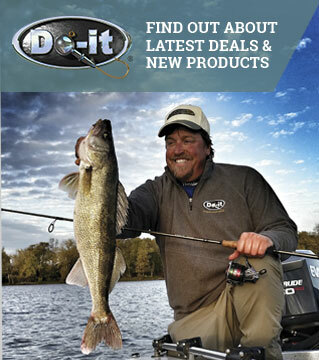 Especially recommended for use with the sometimes hard to cast small jigs. Drawbacks: Most bottom pouring electric melters are designed for bullet casting, but will work equally well for casting jigs and sinkers that are less than 3/4 ounce in weight. Heavier castings and some spinner jigs require lead to enter the mold cavity at a fairly rapid rate — often faster than the hole size on a bottom pouring pot will allow. Heavy castings may show wrinkles or incompletely fill when cast with bottom pour melters. Some molds (such as spinner jigs models) require wire forms that extend above the top of the mold. It can be difficult to properly position the bottom pour spout and mold when wire forms are used.